Cultural Front: Why are all the black poets sitting together over there? Why are all the black poets sitting together over there? Taking the conversation of poets and place in a slightly different direction, I was thinking about how anthologies have a way of situating black poets in relation to each other and various other non-black poets. From one perspective, I suppose people look at anthologies featuring works by African American poets and note that the editors and the poets themselves seem to segregate themselves off and away from, say, general utopian, raceless anthologies. That's one possibility. Then, there's also the chance that black poets are far more likely to appear together in presumable black anthologies because they have little chance of getting into those general anthologies. Sure, big-name poets achieve cross-over appeal and appear in black and general anthologies. But by and large, African American poets are published in designated black spaces. Questions about whether black people are self-segregating themselves or being excluded drive conversations well beyond the realms of literature. Remember Beverly Tatum's Why Are All The Black Kids Sitting Together In The Cafeteria? : And Other Conversations About Race (1997)? Even if you're unfamiliar with the book, you've likely encountered conversations along the lines of black people occupying this or that particular place, this or that black neighborhood, etc. If you check the surface of black arts discourse, you'll see all kinds of statements about self-empowerment and the need for writers to "publish black." You'd have to dig a little bit, though, to see that an impulse for some of that movement to black spaces was at least partially related to how unwilling apparent white spaces were to include more African American poets. There's also the matter that poets of all backgrounds tend to publish regularly in places where they have connections and ties. That groups of poets have links to common social locations and networks likely explains why we see groups of them in one kind of anthology (i.e. collections with primary black writers) and not other ones (i.e. general collections with primary white writers). 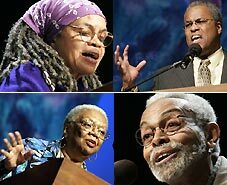 The explanation of why all the black poets are sitting together over there in those anthologies could be linked to why large numbers of black people who situated in those neighborhoods.